If you read my last post you know that I recently attended a wedding this past weekend. Click on the link if you missed it and want to see the cute personalized wedding gift I made for the cute couple. When I making this card I had imagined a tree with the couple's initials carved into it. Trees to me symbolize strength, growth, family and forever and was why I I thought it would make a cute card. The original design of the card has "love" written in the centre of the heart, but of course I always have to put my own twist on it and added the couple's initials. If you look closely you can see right through the plus sign between their initials... I thought that was pretty cool! For this A2 card the files were cut out using the silhouette Cameo. 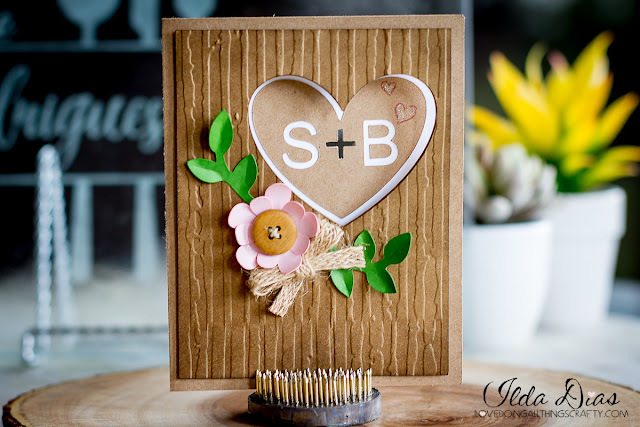 I used craft cardstock and a sizzix embossing folder to create the wood impression. I then rubbed some walnut distress ink along the edges. I added some Wink of Stella to the tiny hearts and the flower petals for a little sparkle. I finished the card by embellishing it with a wooden button and a twine bow. I left the inside blank as I wanted enough room to write a message. Hope you guys liked my Simple Woodsy Wedding Card today. I wish Stefano and his beautiful Bride Breanne, the happiest of marriages. May their love grow stronger and deeper with time.